Huge Savings Item! 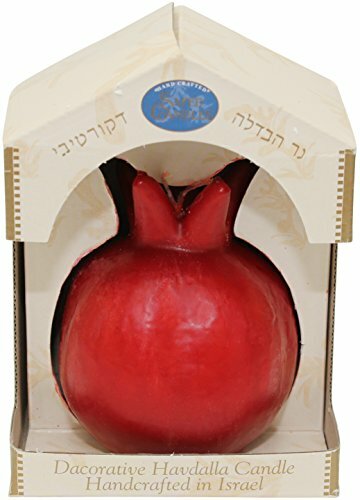 Save 20% on the Majestic Giftware SC-RMPL Pomegranate Shape Safed Pillar Scented Havdalah Candle, 3-Inch X 6-Inch by Majestic Giftware at Home Decor Outlet Store. MPN: SC-RMPL. Hurry! Limited time offer. Offer valid only while supplies last. These beautiful Havdalah candles are hand crafted in the ancient Israeli city of Safed where they are handcrafted in the age old traditional manner. These beautiful Havdalah candles are hand crafted in the ancient Israeli city of Safed where they are handcrafted in the age old traditional manner. Havdalah (Hebrew: הַבְדָּלָה, meaning 'separation') is a Jewish religious ceremony that marks the symbolic end of Shabbat and Jewish holidays, and ushers in the new week. The ritual involves lighting a special havdalah candle with several wicks, blessing a cup of wine and smelling sweet spices. Shabbat ends on Saturday night after the appearance of three stars in the sky.